MSI introduces the GeForce GTX 780 GAMING 6G, a new model with 6GB GDDR5 memory clocked at 6008MHz. It has a 954MHz core and 1006MHz Turbo Boost. Cooling is provided by the Twin Frozr IV Advance cooler. 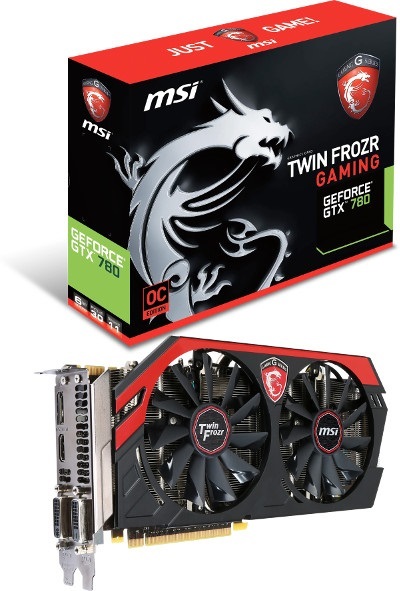 MSI, world leader in graphics card technology Is pleased to announce the availability of the GTX 780 GAMING 6G. Featuring everything you’d expect from an MSI graphics card, but now with doubled-up memory for higher performance at 4K resolutions. With the already spectacular performance of the GTX 780 and the introduction of new games and high resolution monitors comes the demand for more video memory. Combined with the award winning Twin Frozr IV Advanced thermal design, MSI exclusive Gaming App and the all new Afterburner 3.0 the GTX 780 GAMING 6G is an easy step-up into the world of 64-bit 4K resolution gaming, the way it’s meant to be played™. MSI has just released Afterburner 3.0 which is the world's first 64-bit overclocking software for Graphics Cards, Integrated Graphics and Notebooks. MSI Afterburner 3.0 can display all statistical information in 32 and 64 bit games and applications, comes with a multitiude of configuration options, like exclusive Triple Over-voltage, built in video capturing and DirectX 11 benchmark.